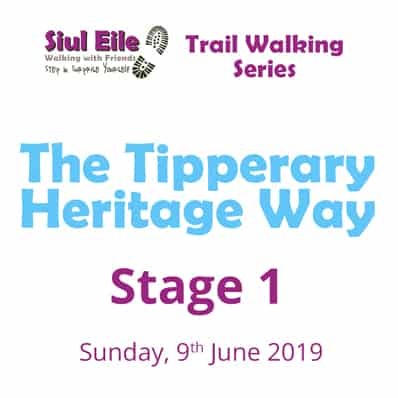 We have a new exciting series of walks in 2019, the Siul Eile Trail Walking Series, using 3 of the National Way Marked Trails in sections which all start or finish in Clogheen, where the first Siul Eile walk took place! We will be dividing the trails into sections ranging from 15-30 km. The routes will encompass rolling hills, riverside paths, secluded forests, hidden gems and forgotten villages. Walk at your own pace, take time out for yourself, step back in time, enjoy the spectacular scenery and wildlife while exploring rural Ireland at its best. • The Avondhu Way (104 km) in 5 stages. Those that complete a full trail will receive bespoke medals with an individual feature of the trail represented on it – definitely a collectors item! Please check our Store for tickets. Can you tell me where the group meet up and when. ?.Is there a C group?.Thanks Ger. Hi Geraldine, thanks for the queries. The vast majority of the walks are C walks, anything ranging from 2km to 12km. There are a number of different Siul Eile groups based throughout Tipperary. Where are you based and what type of walks (terrain and distance) are you interested in? Thanks for the enquiry. What part of Waterford are you from? All are walking groups are currently based in Tipperary, though we have a number of them along the Tipp/Waterford border in Clogheen, Clonmel and Carrick. We are doing the Tipperary Heritage Way in 3 stages this summer, average of 20km each day, see https://www.siuleile.com/store for more details, might interest you in preparing for the Camino.